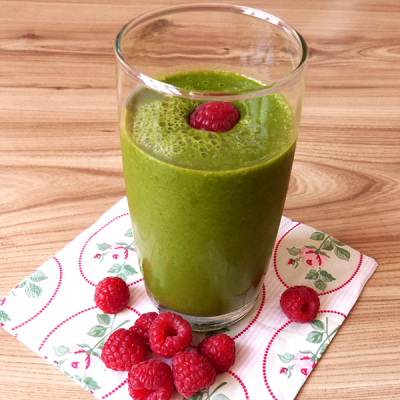 Power up your day with this delicious green smoothie including strawberries, mint and ginger. Lovely supplemented with Lifefood wide superfood range! Quick and easy! Wash spinach and put it in your blender. Then add strawberries, banana, mint, ginger and lemon to it. Add a little water and mix! In a second step, you add Lifefood maca powder, lucuma powder, mesquite powder and barleygrass powder, choose your desired amount of water and mix the delicious raw food ingredients again. Now your smoothie is ready! Enjoy every moment. Pour the green liquid in a glass and garnish it individually with fresh fruits, cocoa nibs or with protein-rich hemp seeds. Made with love! The given amount makes up for approximately one liter of this delicious Green Smoothie. You're not into spinach? How about using kale, kohlrabi leaves, crisp lettuce or carrots green as an alternative? Be creative and pamper your body and soul!